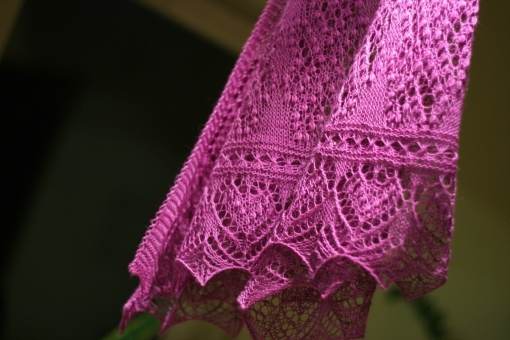 Pattern for a scarf and shawl with pretty lace motifs and a squishy star stitch body. 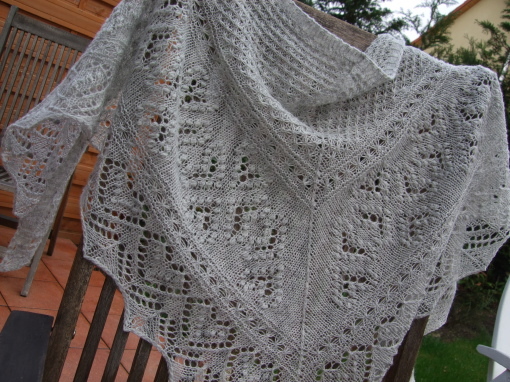 The motifs and construction are based on traditional Estonian lace shawls. The pattern contains the instructions and chart for the triangular shawl as well as for rectangular scarf. Instructions on how to make the scarf wider in turn it into a stole are also included. In den vergangenen Jahren wurde die Strickwelt auf die aufwändig gearbeiteten Spitzentücher aufmerksam, wie sie traditionell in Estland gestrickt werden. Estnische Strickspitze zeichnet sich vor allem durch die eigenwilligen Noppen (auch Nupps genannt) sowie durch einige besondere Motive aus. In der Anleitung sind Anweisungen für das Nacharbeiten eines Dreieckstuches sowie eines Schals enthalten. Der Schal kann beliebig breit gestrickt werden. Das Dreieckstuch weist die Besonderheit auf, dass es an der langen, unteren Kante begonnen wird und nach und nach Maschen abgenommen werden. Die Anleitung ist in Englisch, die Muster sind jedoch in Strickschrift. The scarf is worked in two directions. It starts with an edging and a border sequence which are then put on hold. Next the edging and border sequence are worked a second time followed by the body part of the scarf for as long as you want your scarf to be. In the end both parts are grafted together. This way you not only have matching mirror images of the border but can also make the most out of your yarn. 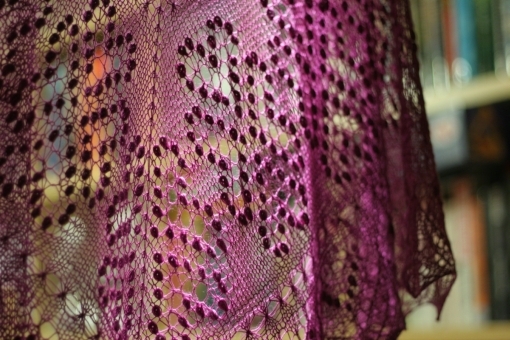 The shawl starts with a very long cast-on on the bottom of the shawl and is decreased gradually until all stitches are reduced at the middle point of the neck. While it is really time consuming at first with the long rows decreases happen quickly and this method develops its own particular draw. Yarn: 600 meters of laceweight yarn. Prototypes were worked in Filcolana New Zealand Lammeuld (600 meters/100 grams) and Zitron filigran Lace No.1 (600 meters/100 grams). Even though they’ve got the same yardage they are as different as day and night. Filcolana is a lofty, wooly, Shetland type of yarn that works up into an open but still very substancial fabric even on 4 mm needles. Zitron Filigran is a dense, smooth and very inelastic singles yarn that creates a much more open and ethereal fabric even on the smaller 3.75 mm needles. Personally I really didn’t care much for working with this yarn but after blocking it turned out nice and it seems to hold the shape well. In the finer Zitron yarn I was able to work 7-sts nupps and still ended up with a few grams of leftovers. While with the Filcolana I stuck to 5-sts nupps and made the cast-off with just a couple of meters to spare. 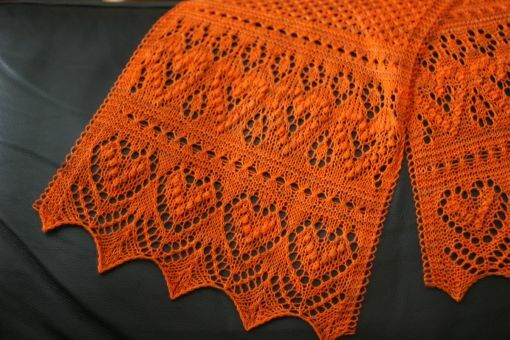 Disclaimer: I feel it needs to be said that this pattern is of course very much inspired by the traditional Estonian lace shawls which have been featured in several publications. On the one hand this surely is not an ingeniously new construction or method or anything. On the other hand I brought a myriad of puzzle pieces together, figured out the stitch counts and made up some pretty charts and instructions pulled it all together into a ready-made pattern. Still, I refute any complaints about plagiarism or lack or originality. It is surely not rocket science to devise a pattern like and if you are an experienced lace knitter you’d probably be able to work your own version from other books and publications on the theme. But for everyone else there are patterns like this to enjoy some of the most entertaining elements that lace knitting has ever seen.